Junkyard Dogs (Longmire Mysteries #6) by Craig Johnson is available at Amazon, Barnes and Noble, and BooksAMillion. From the New York Times bestselling author of The Cold Dish and As the Crow Flies, a modern-day range war in the sixth novel in the Longmire Mystery Series, the basis for LONGMIRE, the hit A&E original drama series. 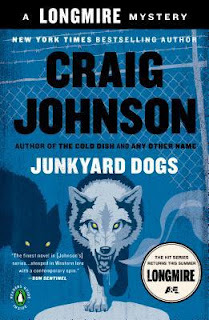 Junkyard Dogs, the sixth installment in the New York Times bestselling Longmire Mystery Series, the basis for LONGMIRE, the hit A&E original drama series, takes us to Durant, Wyoming. It's a volatile new economy in Durant when the owners of a multimillion-dollar development of ranchettes want to get rid of the adjacent Stewart junkyard. Meeting the notorious Stewart clan is an adventure unto itself, and when conflict erupts—and someone ends up dead—Sheriff Walt Longmire, his lifelong friend Henry Standing Bear, and deputies Santiago Saizarbitoria and Victoria Moretti find themselves in a small town that feels more and more like a high-plains pressure cooker. The hilarious and suspenseful sixth book in the Longmire series from The New York Times bestselling author of Hell Is Empty and As the Crow Flies finds our sheriff up to his badge in the darker aspects of human nature, making his way through the case with a combination of love, laughs, and derelict automobiles. This has been my least favorite book in the series thus far. I figured out the last book (The Dark Horse) before I should have but it was because my health problems gave me some insight that most readers probably wouldn't know. This book wasn't like that - this book isn't as polished as the others in the series. There are at least two spoilers scenes that jumped out at me because the conversations were out of place and my immediate thought was: why bring this up right now? There's more important stuff going on...oh, wait. It would only be brought up if it tied in to the case somehow. And most of the clues I needed to solve this crime were right there in those scenes that felt out of place. Thank you for trying Mr. Johnson but you didn't get one over me this time. And I do expect better, because one of the things I like about this series is that I wasn't able to solve the first books until I was supposed to - I was along for the ride with Walt. This book made me feel too far ahead of him. However, this book continues building the romances slow and steady, just the way I like. And the romantic plot-threads are what kept me going through this book because I have no idea where these romances are headed (and I want to know). I prefer romances written by men and targeted at men, they feel more real to me than bodice-ripper romances, and this series, taken as a whole, is a superb example of how romances should be done.